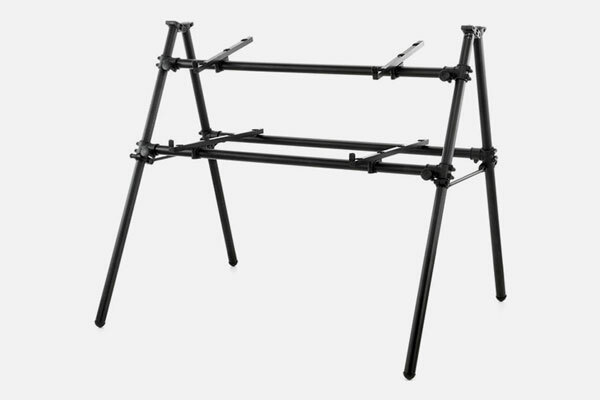 Jaspers 2D-120B Keyboard Stand, made in Germany, from black anodized aluminium, for 2 keyboards, height 110 cm, width 130 cm, inner width 120 cm, max. adjustable depth 70 cm, with handwheels. The lower tier is supplied with holders of 60 cm length, is strengthened by a second tube and can be used for very heavy instruments. Other holders of 40 cm length. All tiers are height adjustable and inclinable. Stand can be folded for transport. Weight capacity: bottom tier up to 40 kgs, upper tier up to 15 kgs or more with strengthening set. ⊙ On Order. The item will be ready for shipment in the next 3-5 working days.